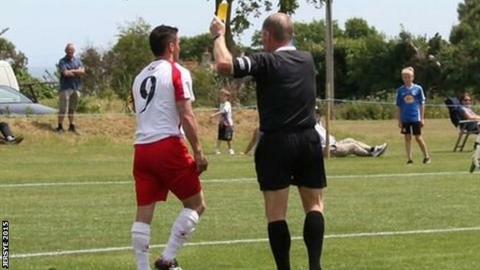 Referees in Jersey will go on strike on Saturday in protest over continued poor behaviour at matches. Their action will affect all fixtures in Jersey, including the game between the island's top two sides, St Paul's and St Peter, which could decide who wins the league title. Referees threatened to quit in October after 10 red cards in 12 games. Incidents include a physical assault on a match official and abuse from players, coaches and spectators. The Jersey Football Referees Association (JFRA) say three teenage officials locked themselves in a changing room after a match following "prolonged insults from some junior players, their coach and also some parents/supporters." The statement continued: "Our executive met very recently and had an in depth discussion on this matter and came to a clear collective consensus that the time was now right for referees themselves to stand up and be counted and to seriously consider taking some form of action. "Referees of all levels have been subjected to continued misconduct including that physical assault and lots of insulting and offensive abuse, often of a sexually inappropriate nature, which then become serious safeguarding and welfare issues. "It was agreed that a message needs to be sent out to clubs, players of all ages, managers/coaches, parents and spectators that such incidents can no longer be tolerated, and if we don't act now island football will lose more referees which it simply cannot afford to do." JFRA chairman Paul Daniel told BBC Sport there will be a further meeting on Wednesday evening to discuss their concerns. "These disciplinary measures are apportioned in line with clear guidelines from the Football Association," their statement said. "Just last week a disciplinary hearing banned a local player for six months for grabbing a referee's shirt and aggressive conduct. "Whilst the current problems with indiscipline lie largely at the feet of a small minority of participants, referees themselves do need to take some responsibility and agree a code of consistency which the JFA has been pushing for since the start of this season. "Assaults on officials, intimidation of referees and verbal abuse are, clearly, unacceptable and we will continue work with the Jersey Football Association Referees' Committee in an attempt to improve the game we all love." Jersey's football authorities have been trying to deal with indiscipline in the island game for some years. An investigation was launched after Portuguese Club walked off in protest at a referee's decision in 2015 - they were later suspended and left the league. It prompted long-time referee Mark Le Cornu to resign from his role as a league vice-president. And 29 September last year was dubbed 'Red Saturday' when 10 red cards were shown in 12 games on the island - five for foul and abusive language and two for violent conduct - compared just four reds in the 54 matches in England's top four divisions on the same day.